Appendix to the contribution of Ursina Kuhn et al. This webpage complements the Swiss Social Report 2016 emphasising the wellbeing of the Swiss population. In particular, these page contains all graphics, related data and additional documents to the authors contributions. Based on systematically prepared data and indicators, the Social Report 2016 provides information about the current status and development trends in Swiss society. This edition focuses on wellbeing: How satisfied are the Swiss with their social living conditions and their financial situation? Does religion still play a role in the search for a meaningful life? What impact do social developments such as the rise in divorce rates have on the wellbeing of the affected people? Does political participation make people happy? Are impoverished people less satisfied with life than the wealthy? Does increasing mobility in work and leisure time have a positive or negative effect on wellbeing? In addition to a selection of 75 indicators on these and other topics, the Social Report contains five analytically oriented in-depth articles that focus on wellbeing and address the following topics: income and social contacts, dissociation from religion, wellbeing and poverty, political participation, as well as environment as a health factor. Order the book on Seismoverlag. Franziska Ehrler, Felix Bühlmann, Peter Farago, François Höpflinger, Dominique Joye, Pasqualina Perrig-Chiello und Christian Suter (eds). 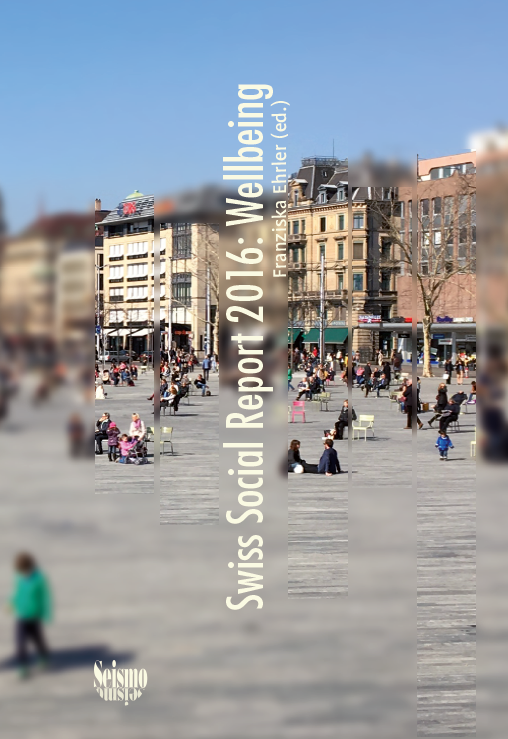 Swiss Social Report 2016: Wellbeing. Zürich: Seismo-Verlag.